The last final for the semester has been taken, bags packed and now you are on your way home, to friends, relatives or wherever the next four weeks will take you. B-R-E-A-T-H-E. It seems like forever since you could just be, sit in solitude and ponder how you feel, what has occurred over the past five months. How have you evolved? Or are you the same person who stepped on campus in August? If you are, why hasn’t there been a change? Or should there have been one? Advent began four Sundays prior to Christmas. During Advent Season, we are called to pray and reflect. Our community has been fractured by many issues, we are called to be one and the “keepers and protectors” of our sisters and brothers. How this is to be accomplished is the challenge. Often, it is believed that the powers that be should be the driving force to rectify the ills. In reality, everyone is charged to address the inequities, disenfranchisement and establishing an environment where every community member is felt valued, appreciated, safe and welcome. Fr. John began the call acknowledging the divide that emerged in our community because of the contiguous election year. He stated we must work toward the common good which includes having critical dialogue that respects the dignity of all persons. During this time, I ask for each of you to determine your strategy to contribute to his request. The 2017 Spring Semester begins on the National Holiday celebrating Dr. Martin Luther King, Jr. 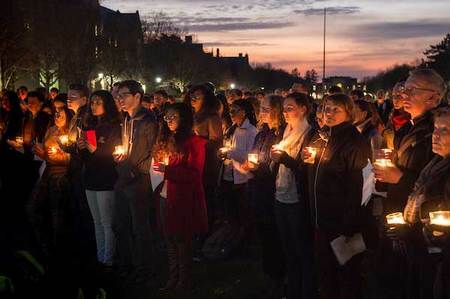 The interfaith prayer service will be in the Main Building at 11:00 p.m Monday, January 16. The second Walk The Walk Week begins the week of January 22. Multicultural Student Programs and Services will host RAPtivist Aisha Fukushima on January 23 and co-sponsor Citizen author Claudia Rankine on January 26. RAptism is a global hip hop project highlighting how culture contributes to the universal efforts for freedom and justice by challenging apathy with awareness, ignorance with intelligence, and oppression with expression. These of two of several events occurring for more information and listing of other activities check the 2017 Walk the Walk Week site. Both speakers compliment the fall Solidarity for Racial Justice campaign. MSPS’ Spring 2017 MLK Study of Race speakers will continue the discussion of social activism and the various forms it can take from the kneeling of Colin Kaepernick to demonstrations on college campuses and in high schools. Information will be shared on the MSPS website and Facebook page, as well as in our weekly announcements. Feel free to contact the office either by calling or email for more information. We hope you will take advantage of these opportunities to have the critical dialogues that Fr. Jenkins referenced during the November 14 interfaith prayer service. Have a blessed Christmas and Happy New Year. This entry was posted in Editorial, MLK, MLK Study of Race Series, Social Activism, Societal Issue, Uncategorized by Iris Outlaw. Bookmark the permalink.